Rising senior Amy Chen 19 IL created this inspired piece for Urban Wildlife: Learning to Co-Exist, a multidisciplinary show on view through August 22 at RISD’s ISB Gallery. Faculty member Lucy Spelman, a biologist and animal conservation expert who teaches in Liberal Arts, challenges students to create images that help viewers connect with scientific concepts while also inspiring them to support conservation. 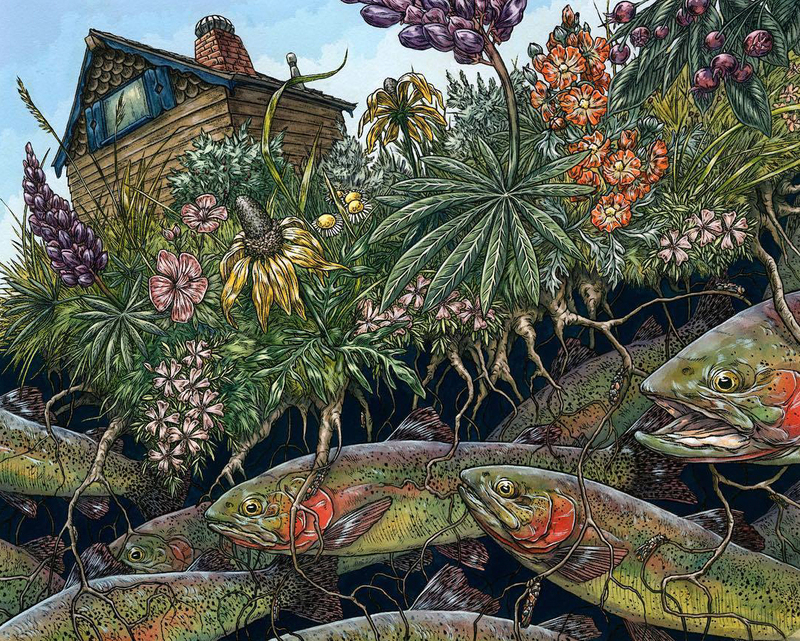 She recently teamed up with Illustration Department Head Susan Doyle 81 IL/MFA 98 PT/PR to co-curate Urban Wildlife: Learning to Co-Exist, a multidisciplinary juried exhibition on view to the public through August 22 at the department’s riverfront ISB Gallery. Doyle points out that science and art—particularly illustration—have always been interconnected. “The earliest research on animals and plants was shared by botanists and others via prints, which depended on illustration,” she explains. Today, the internet gives contemporary artists endless opportunities to research topics of interest and communicate directly with scientists in the field. Urban Wildlife presents work by RISD students and faculty members along with local and global artists. Geographically, the habitats that inspired the work range from Concord, MA to Sydney, Australia to Guwahati, India. A piece by geophysicist and printmaker Ele Willoughby focuses on the declining bee population in Toronto. Rising RISD junior Ali Bartlett 20 IL illuminates the challenges faced by fisher cats in the Pacific Northwest. And ornithology expert Ingrid A. Erickson reflects on the American kestrel using data derived from hands-on research at the Jim Arthur Raptor Medical Center in North Carolina. Despite its national and global reach, the exhibition emphasizes urban wildlife right here in Providence—the foxes, coyotes, deer, raccoons, cottontail rabbits and myriad bird species local residents encounter in their own backyards. “I’m thrilled to show at this gallery in downtown Providence, a block away from the falcons,” exclaims local raptor photographer Peter Green. 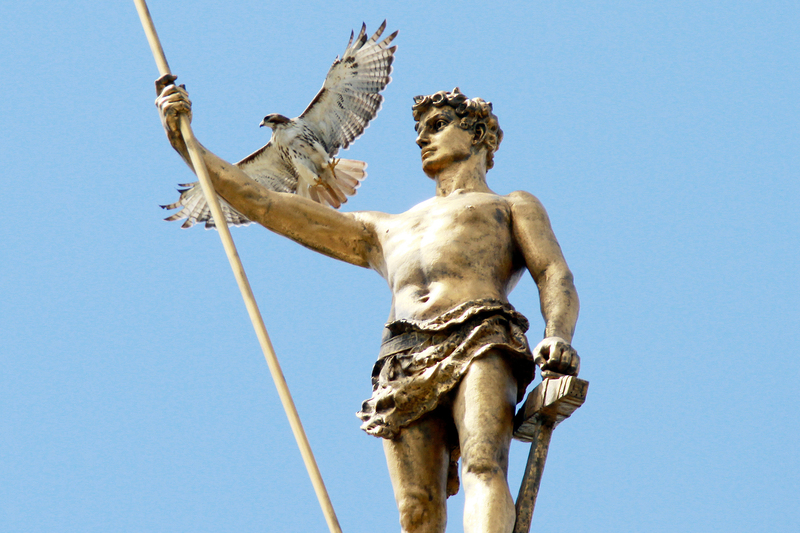 He lives only a few blocks away, across from the now-vacant, 26-story “Superman building,” where he has a great view of peregrine falcons and red-tailed hawks swooping down to feast on the city’s pigeon population. Green, who presented the first in a series of Urban Wildlife-related talks and demonstrations, hopes that his work will dispel myths about urban raptors and encourage residents to consider the effects of their actions on Providence’s birds of prey. The chemicals we use to care for our lawns, he notes, can easily poison groundwater, and the powerful poisons used against rats remain active in their bodies for days, which endangers the birds that prey on them. This piece by alumna Emily Poole 16 IL reflects on the effects of tainted groundwater on local trout. Other talks presented in the gallery during the course of the show will focus on the dangers of inadvertently providing food to coyotes, which flowers are most attractive to urban pollinators and how to build nest boxes for local kestrels. Maharam STEAM Fellow Kate Aitchison MFA 16 PR pursues projects that combine art and science for the good of the natural world. 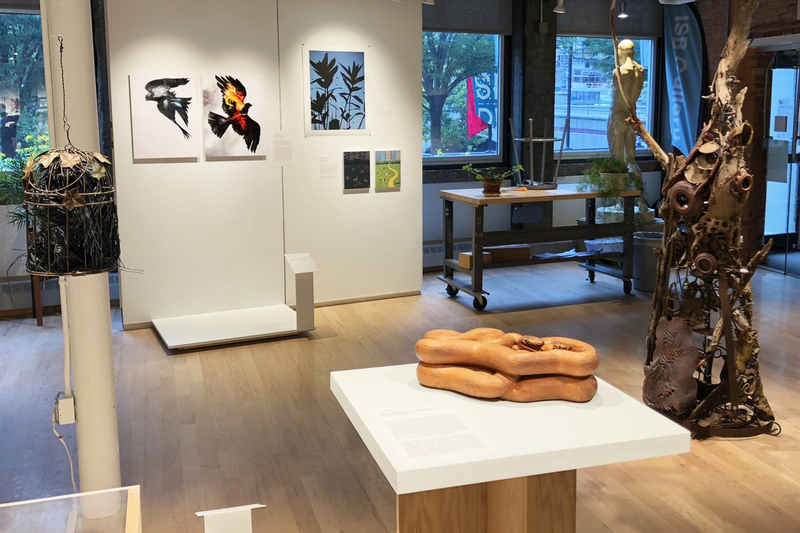 At RISD Weekend 17, four young alumni explain how they’re harnessing their passion for the natural sciences and building ecologically focused practices. An internship at Mystic [CT] Aquarium gave Rae Whiteley 17 IL an opportunity to capture the emotion behind inter-species communication.